After a very successful deployment in May 2007, Carolina returned to Ghana in November 2008 for three weeks. During her 2007 Ghana visit, Carolina didn’t have enough time to examine all the children at the Rev. Alec Jones School in Nkanfoa, so she returned to be able to finish the screening of those remaining classes that missed out. The eye testing process was similar to how it was conducted in 2007. Carolina had a team of 9 optometry students who would perform the eye exams at the school. 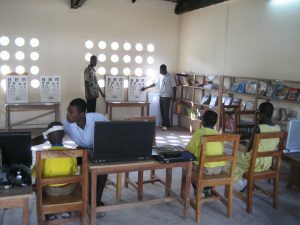 Each child was given an extensive eye examination, which was performed entirely by one student. The importance of this is that a student feels totally responsible for the patient when performing all tests and coming up with a diagnosis and treatment plan by them themself. Unfortunately, Carolina’s Ghana visit coincided with the examinations period of the optometry students, so they weren’t able to perform screenings every day. Nevertheless Carolina and her team managed to screen 52 children in that three-week period and Carolina was able to train 9 optometry students.